I’m not not doing the Rosh Hashana service because I have to be busy with food prep… I’m not praying because I don’t want to. 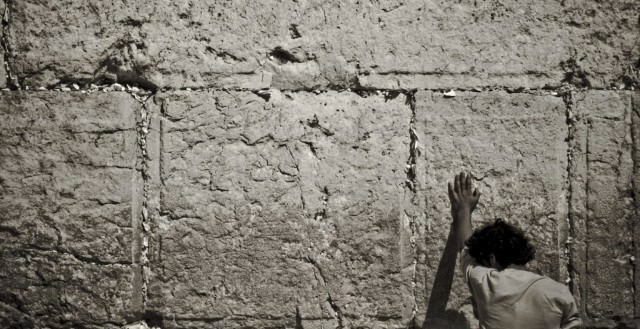 Prayer is an intimate experience, like kissing on the lips, and I’m not always in the mood to take that step with G-d. Sometimes I want to sit with my arms folded hard in front of my chest, and wait for Him to woo me. After the rocket fire we’ve endured, the soldiers and citizens we’ve lost to terror, the tears, blood and sweat that we endure daily to live in our land, illness, pain, death, both personal and global, I want Him outside my bedroom window with a boom box playing Peter Gabriel. So instead of a deep soul-baring session, I pulled a slip-out-the-back-Jack, spiritual version of “I’ve got a headache” and got busy peeling pomegranates and arranging fresh dates on the table. It’s a justified stance, but as I watched the candles flicker beyond the table, I allowed my eyes to adjust to a wider lens, and a more generous perspective began to take hold. In spite of my slapdash indifference toward G-d, my candles are still lit, the table is set, and I’m still thinking about Him. We have a relationship. I don’t always appreciate the way He pulls rank. I have very little understanding about why He does what He does, but in spite of that, I’m in this for the long haul. I continue to ask impossible questions, and push for impossible answers, and search for meaning in the hot mess. I’ve learned enough from my earthly relationships to know that there is more to making it work than what I want, what I deserve and what I think I see. Hey, it’s not always soft and fuzzy, or even screen-worthy, but it’s real, and it’s fertile ground for some steamy stuff. You know how Jews attend Rosh Hashanah and Yon Kippur services more than service at any other time in the year? (Ever heard of Purim people? Waaay more fun.) That kind of attendance doesn’t happen because we’re looking for a soul-loofah, or because of the nostalgic melodies, or because Mom says “we have to.” That may be part of it, but mostly, we go because regardless of how disappointing our lover may be, we still have a basic human need for love and connection. It’s no small thing that after 5773 years, with all the legitimate reasons we have to be mad, and sad and broken, we (a lot of us… maybe even enough of us) still show up. We continue to dialogue, even when we don’t want to. That’s what lovers do – we push and pull at each others’ hearts until we feel something deep and honest. That’s what a relationship is. Even in our pain and grief, when it seems that there is very little to be grateful for, even when we’re mad at Him, He still churns out fabulous sunsets and really good mangos, and allows us to read self-indulgent op-eds if we so choose. When I’m really being honest with myself, I see that even when I don’t want Him to, He shows up all the time, arms wide open, ready to take me as I am. And at the end of each day, whatever my mood may be, I’d rather go to sleep at night giving G-d a lackluster peck on the cheek than walk out of the house altogether. This post was originally published on timesofisrael.com..